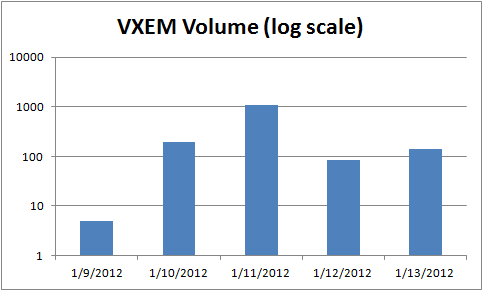 It looks like VXEM Futures launch was a success after all - total volume for the first week was 1527 contracts, and current open interest stands at 380. Wednesday was a particularly active day, trading over 1000 contracts. Trading activity seems to be distributed across months with March contract being the most active. CBOE already indicated that VXEM options are on the way, and it would be very exciting to see another volatility product in addition to VIX.